The following contains excerpts from the study Five Steps to Kickstart Brazil, published by the authors on 11.21.2014. 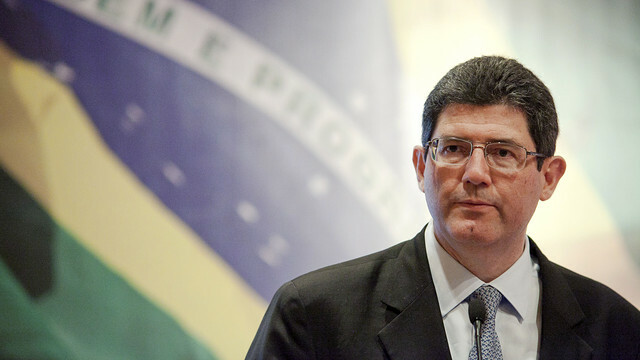 On Thursday November 27 Brazilian President Dilma Rousseff named former treasury secretary Joaquim Levy as her next finance minister. The appointment coincided with Thanksgiving in the United States, but it remains to be seen if it will be a blessing for Brazil. Levy has promised to restore fiscal balance in Brazil–something we have underscored as crucial for kickstarting Brazilian growth. But his job will not be easy. Fiscal policy is at the heart of the current Brazilian malaise. Over the past decade, Brazil has parlayed strong growth into expansionary fiscal policy. Government spending leapt from 36 percent of GDP in 2004 to nearly 42 percent in 2014, financed in part by increasing revenues due to the global commodity boom. This level of spending generally exceeds that of other upper-middle-income economies, but it was not alarming as long as growth was strong and Brazil’s terms of trade remained robust. Yet while revenues have recently tapered, spending has not. 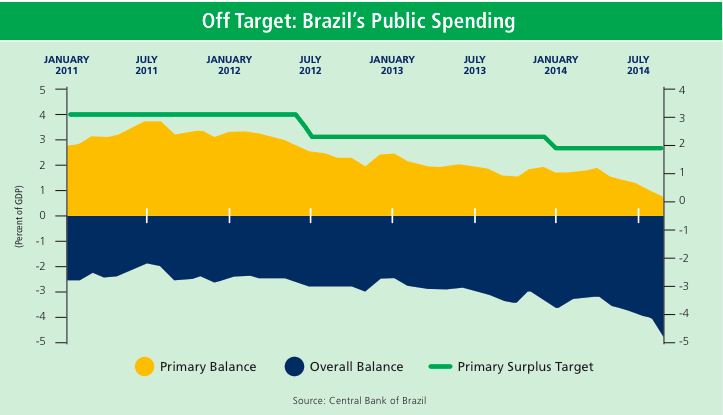 The primary (pre-interest) surplus target, a crucial pillar of Brazil’s tripod of macroeconomic stability (the other two are inflation targeting and a flexible exchange rate ), has been continuously lowered and missed since 2011. Fiscal results for 2014 point to an all-but-complete erosion of the primary surplus. Meanwhile, rising interest costs have pushed the overall budget deficit towards five percent of GDP. Brazil’s fiscal position will face further stress given the country’s expanding debt portfolio, which has jumped from 53.4 percent of GDP in 2010 to 61.7 percent of GDP in 2014. Deteriorating fiscal conditions create a negative environment for growth. As public sector debt absorbs a greater percentage of precious savings, even fewer resources will be available for productive investment. Moreover, fiscal uncertainty could scare off market investors just when Brazil needs them most. Speculation already abounds that the country could lose its investment-grade status conferred by the big three credit rating agencies. Another downgrade (S&P downgraded Brazilian sovereigns to a notch above junk in March 2014) could lead to still higher interest rates and make growth opportunities even more scarce. Not all public spending in Brazil is wasteful. In fact, some government programs set global standards in terms of efficiency. For example, Bolsa Família, a conditional cash transfer program, benefits roughly 13 million poor families at the cost of just 0.5 percent of GDP. The Partido dos Trabalhadores (PT) governments of the past 12 years have also increased spending in health and education, achieving important advances, though the quality relative to cost remains low. Still it is not difficult to identify bloated line items on the public books, starting with the whopping 39 federal ministries, exorbitant public-sector pensions, and white-elephant projects such as an unfinished alien museum. Brasília will face structural challenges even if there is a concerted effort to cut the pork. Fiscal consolidation in times of lean growth is never easy. For example, since 2011, the government offered selective tax breaks for struggling industrial sectors. The idea was to spark growth, but state coffers took a hit while coddled sectors continued to lay off workers. Meanwhile, rolling back popular but costly programs implies significant political risk. In the summer of 2013, a modest 10 cent (R$ 0.20) hike in São Paulo’s bus fares ignited protests that brought millions to the streets, shaking Brazil to its core. Revising price freezes on electricity, for example, could induce a similar reaction. Finally, the government has provided large resources to public banks, chiefly the Banco Nacional de Desenvolvimento Econômico e Social (BNDES), the massive national development bank. These off-budget (“below the line”) operations are not fully reflected in the primary surplus but ultimately have a significant fiscal cost as the treasury is forced to borrow at rates much higher than what it receives on its subsidized loans to BNDES. He must set a direction early, ideally with a multi-year plan of fiscal consolidation that begins with a focus on transparency. Since 2011, Brasília has leaned on various accounting measures to manipulate headline fiscal results, making the reported numbers increasingly irrelevant. Measures currently under discussion would allow the government to meet its primary surplus target for 2014 (1.9 percent of GDP) by entirely excluding certain expenditures from calculations. This would be a step in the wrong direction. Instead, Rousseff’s first step should be to present a transparent and realistic picture of fiscal accounts, including below-the-line items. A significant tax reform, which has been debated since the 1990s, would be a crucial second step. Brazil currently has a bizarre system of state-level value-added taxes based on the place of production. This model leads to high compliance costs: Mid-sized companies average 2,600 growth-killing hours a year in tax-related work. The convoluted structure also generates market distortions as businesses choose their locations based on taxation rather than economic efficiency. A tax reform that unifies value-added taxes would lower growth-dampening compliance costs and distortions. Given current fiscal conditions, an outright tax cut is not advisable. But a revenue-neutral reform should lower overall costs for business. In the long term, pension reform could defuse a fiscal time bomb while encouraging saving. Brazil already spends as much of its national income on pensions as do richer and older European countries. As Brazil ages, pension expenditures will expand exponentially, crowding out other social spending and investment. Moving away from the current pay-as-you go system towards a capital-backed system could also help increase Brazil’s chronically low savings rate. Currently, those with higher incomes — the people who are actually in a position to save — often have little incentive to do so as they can simply await generous pensions; pensions that will weigh heavily on the state’s fiscal balance. A targeted reform could lower transfers to the wealthy while still protecting poorer retirees and easing the mounting pressure on the government’s books. Brazil’s fiscal unraveling has been years in the making, and it will likely require several years to fix. While some costly policies could be rapidly addressed, the markets should be patient. Nevertheless, if President Rousseff sets a clear tone of fiscal consolidation early in her second term, she will ease short-term market jitters and position her country for long-term sustainability. Fiscal reforms were always unlikely in 2014 — an election year for a left-leaning president. There is no such excuse in 2015. 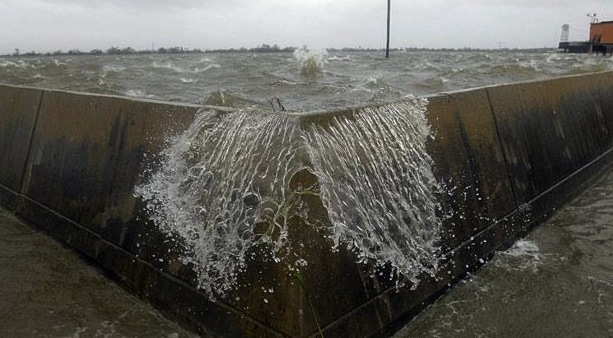 And if the Levy breaks…? This entry was posted in Brazil and tagged Bolsa Familia, Brazil, Dilma Rousseff, finance minister, fiscal balance, fiscal probelms, fiscal spending, Growth, Joaquim Levy, Latin America blog. Bookmark the permalink.